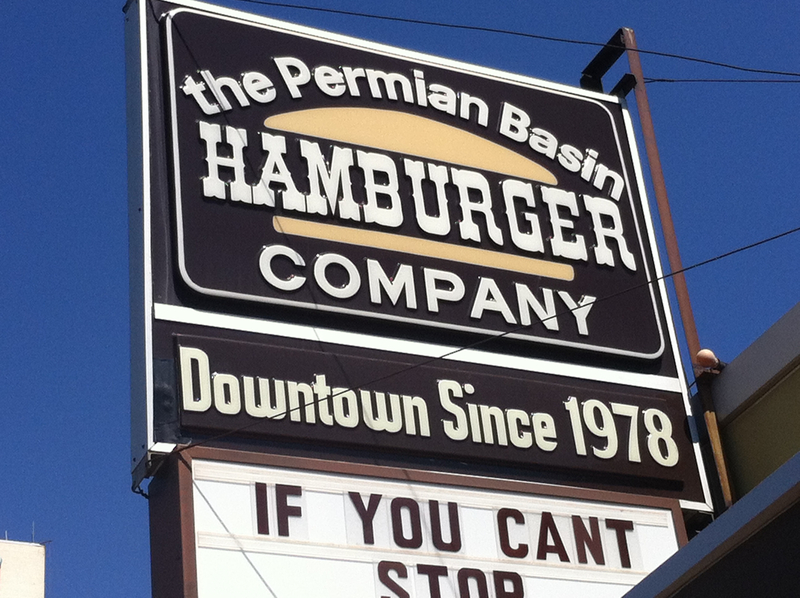 For years, as I’ve been traveling back and forth to Odessa for business, I’ve seen the Permian Basin Hamburger Company. I’ve even tried to eat there on a couple of occasions. But until today, the stars had not so aligned themselves as to allow it. The menu, on the outside wall, appeared straight-forward, so I went in. It appeared fairly standard with a line working toward the door out of cattle shoot from the left corner. 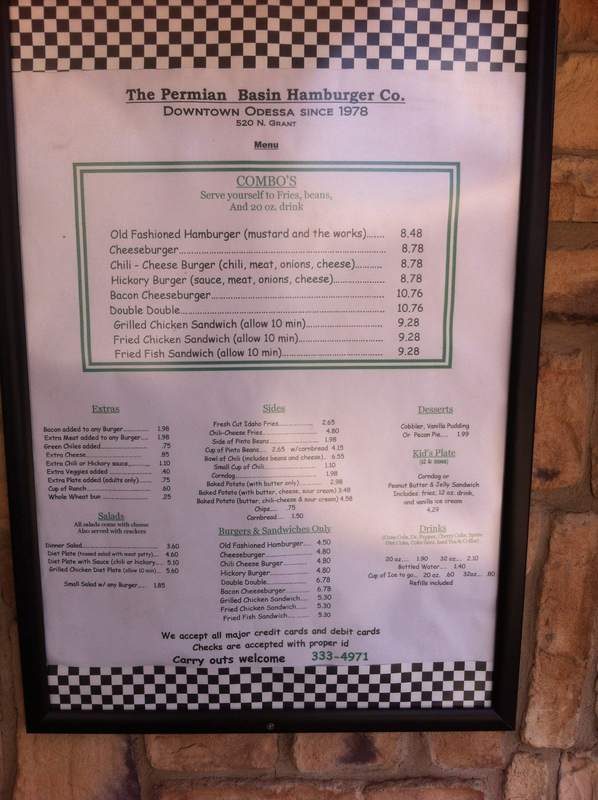 When I got to the counter to order, I was standing at a three-quarter’s height wall directly in front of the griddle. 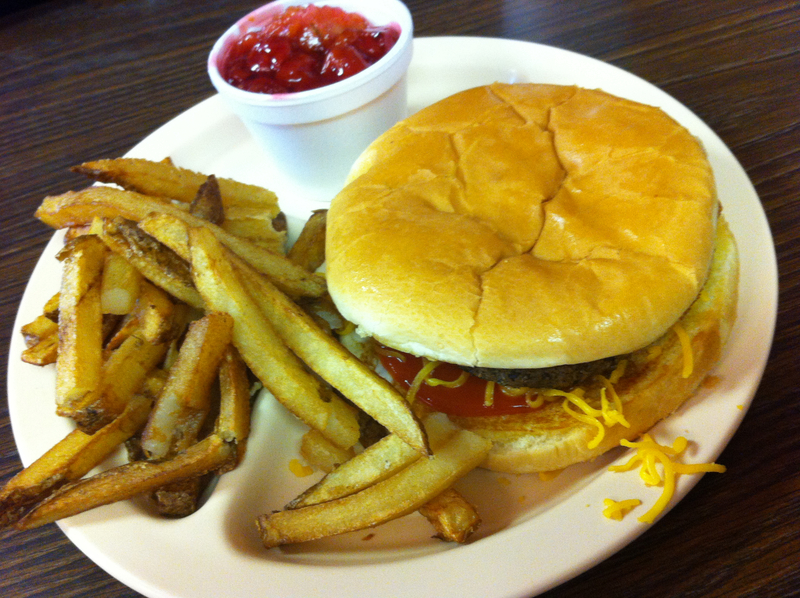 I ordered a cheeseburger, and the cook took a patty off the front of the griddle, slapped it on a giant Colonial bun, spread some grated cheese across the top of it and handed it to me on a divided plate (like you would get in a school or hospital cafeteria). Next in line was a steam table (again like you see in a school cafeteria) which contained french fries and re-fried beans. I’ve never been to a place that served beans with their burgers. Interesting. These were followed by small styrofoam containers of dessert – banana pudding and cherry cobbler. 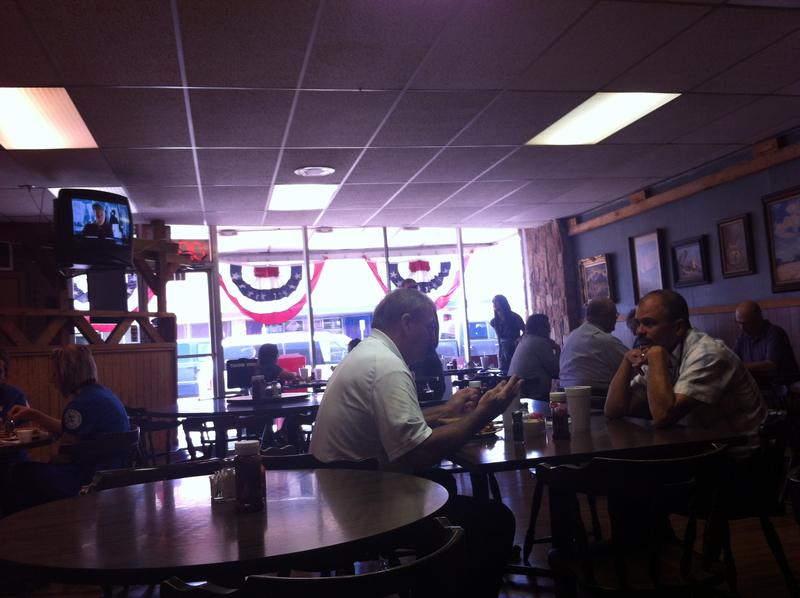 This is the view from my table top toward the front of the restaurant. Most everyone that was there appeared to eat there on a regular basis by the way they carried on conversations with the other patrons and the wait staff. The french fries were skin on and, had they been hot, would have likely been quite good. The burger itself was thin and pricey (for $8.48 with fries, beans and a drink) and I’m just not a fan of melted grated cheddar cheese on a burger. The cherry cobbler was industrial tasting, at best. All things considered, it was comparatively pricy and not terribly good. Sadly, I had built it up in my mind over the years that I hadn’t made it there so it was a truly disappointing experience.